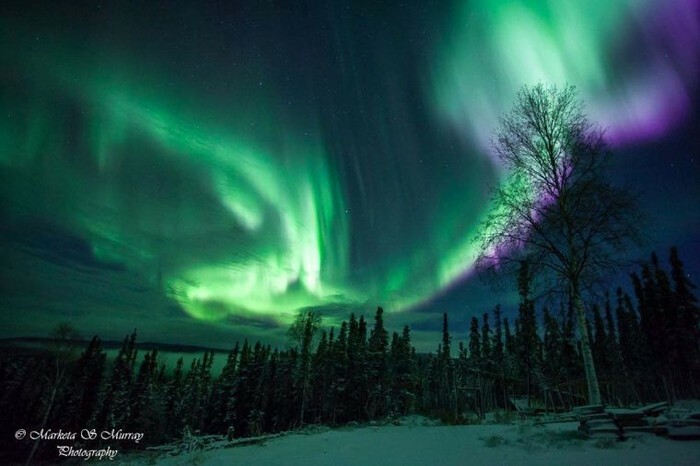 Fairbanks Alaska is the ideal place to view the Aurora Borealis, being inside the "aurora oval." The Northern Lights are a spectacular sight and are a very romantic place to take your special someone. The lights are a masterpiece of Mother Nature, and a once in a lifetime phenomenon to witness. So, when is this natural wonder best viewed at? The Aurora Borealis is best viewed between 8:30 and 12:30 (10:00 and 2:00 solar time). As far as the dates and specific times of years go, there really isn't any. The Aurora Borealis is a random occurrence due to the randomness of the Sun, which causes it. So look at Weather Channels, and find out when they will be occurring, and book yourself a wonderful hotel in the best viewing city in North America! Aurora Borealis happens when solar wind from the sun hits Earth. Solar wind is ions from the sun that flow out of the sun. When the ions in the solar winds hit the Earth's atmospheric atoms, they collide and release energy, which is seen in the sky. The Aurora Borealis usually can be seen in areas that are dry and cold, due to the atmosphere there and the location of the poles. The colors of the lights are based on the altitudes of where the collisions are happening. High altitudes emit red lights, low altitudes emit green lights, and even lower altitudes emit blue lights. So whats the difference between the Northern Lights and the Southern lights? The Northern Lights are called Aurora Borealis, while the Southern lights are called Aurora Australis. The only difference between the two are one is on the Southern half of the Earth, and one is on the Northern.